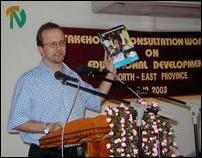 UNICEF Sri Lanka representative, Mr. Ted Chaiban, releasing the first copy of State of the World's Children Report-2004 at an event in Trincomalee Thursday. The UNICEF report said that whilst the achievements in literacy and women's education in Sri Lanka must be celebrated, there remain some pressing needs in terms of access and quality of education in the country. "Although Sri Lanka can celebrate its notable achievements in girls' education, there still remains a need for increased resources and attention to improve the access and quality of education across the island, particularly in the North and East," stressed UNICEF's Resident representative in Sri Lanka, Mr. Ted Chaiban, at the launch of the report in Trincomalee.
" Although 90% of Sri Lanka's children attend state-run schools, which provide free education including free textbooks and uniforms, most schools could not be considered 'child friendly'. Unfortunately, too many principals and teachers have negative attitudes towards children, especially those from a disadvantaged background. "There is a basic lack of services as water and sanitation in schools. Accesses to health services are inadequate for students. Nutritional problems exist and there is a lack of inclusive education. "Therefore, across the island, UNICEF is working to develop a positive learning environment for children by training teachers and principals to apply a 'Child Friendly School' concept. In 2003, over 300 schools adopted the concept, which focuses on creating an environment that promotes learning achievment, child protection, physical and psychological well being and encourages child participation.
" In addition, the impact of the conflict has been far- reaching and devastating on Sri Lanka's education system. In the North and East, it is estimated that 94,000 children are out of school, there is a high level of non-enrolment, the rate of student drop-out is 15 %- almost four times the national average, absenteeism is high and the teaching and learning quality is low. All these factors are the direct result of displacement, psychosocial problems and damaged infrastructure caused by the conflict.
" Furthermore, the conflict has left many children in need of special protection-those in child labour, street children, child recruits and children in commercial sexual networks who need access top non-formal education and catch-up education.
" The UNICEF recognizes the urgent need to improve the accessibility and quality of education across the island, focusing on those regions where children remain marginalized, vulnerable and lacking in opportunities. "In 2003 UNICEF worked to extend and provide catch up education to 23,500 primary and secondary school children, implemented re-admission programmes for school drop outs, rehabilitated 50 % of damaged schools in the North East and provided school kits to over 100,000 disadvantaged children across the island.
" But a lot more needs to be done. In Sri Lanka we need to continue to turn our attention and resources to providing even better access and standards of education of education for all children and make sure that the opportunities exist that enable them to reach their full potential in life.
" In launching this flagship report in Sri Lanka, UNICEF is first and foremost celebrating the success of gender parity in the island. The successes achieved here can give hope for other nations in achieving this important Millennium Development Goal by 2005.
" All over the world, in launching this report, UNICEF is calling for immediate action from all sectors of society on the issue of girls' education. Sri Lanka is one of the few countries that has made good progress, but for the whole world to make substantial global progress toward the 2005 Millennium Development Goal of gender parity in education, we need to see immediate, credible and sustained action. "The entire agenda of global goals for 2015 is on the line. The lesson from Sri Lanka is that no country should wait for the target year of any goal to come into sight before getting serious. Credible action is needed now.
" Getting all girls into school is now the world's first test. Getting quality and access to education is now Sri Lanka's."